The OpenShift Container Platform (OCP) is the primary way to manage your application development experience in the Cloud. From code, to containers, to deployments in a polyglot of languages and frameworks, nothing is easier to integrate in to your toolbox or IDE than OCP. To make this process of getting your very own private Cloud based on OCP, a simple and fast installation project was created. 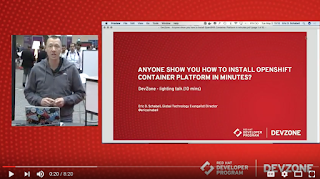 I spent some time on presenting this to various groups and at this years Red Hat Summit event. It has also become a basis for the free online workshop where you can enjoy application development with containers in the Cloud. The slides from this session are online.